A small mountain town hides a dark secret... When his father's death brings Grant Shipman to the Appalachian town of Wallen's Gap, he believes his biggest problem will be dealing with the slow pace and odd townsfolk. But something sinister is at work. A dark power rises, an echo of the town's bloody past. A book of blood magic offers an unspeakable horror a gateway into the world of the living, and only Grant stands in the way of their Dark Rite. 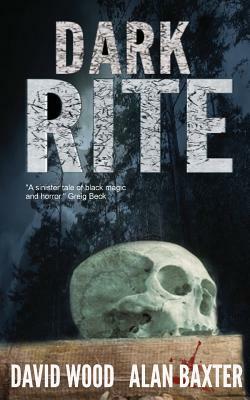 "Wood and Baxter have delivered a stunning tale that reminds of an early Stephen King's talent for the macabre with a pinch of Graham Masterton's flair for witchcraft and terror. A sinister tale of black magic and horror - not for the faint hearted." Greig Beck, bestselling author of Beneath the Dark Ice and Black Mountain "Wood and Baxter deliver a fast-paced horror thriller." J.F.Penn, author of the bestselling ARKANE thriller series "Wood and Baxter have taken on the classic black magic /cult conspiracy subgenre, chucked in a toxic mix of weirdness, creepshow chills and action, and created a tale that reads like a latter-day Hammer Horror thriller. Nice, dark fun." Robert Hood, author of ImmaterialandFragments of a Broken Land: Valarl Undead.